Opt for floating shelves to give your favorite floorspace-saving storage method a sleek, modern look. By Sunday evening, you'll have a new spot for reading material, tchotchkes, and anything else you'd like to display or keep within easy arm's reach. Physically and visually lighter than bookcases—hello, extra floor space—shelves are a favorite storage option for everything from books to souvenirs, suitable for virtually any room. Of all the designs out there, many prefer floating shelves, because with their bracket hardware hidden, these wall-mounted surfaces take on a sleek, modern look. DIY floating shelves are easy for anyone to install. Here are five different ways you might approach the project this weekend. There’s a lot to be said for simplicity, particularly when you’re pursuing a clean, minimalist aesthetic. 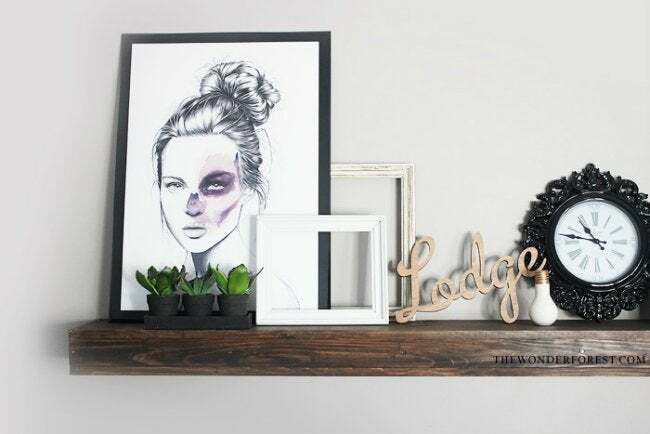 Over at The Wonder Forest, Dana created DIY floating shelves from stock lumber. Her secret to keeping the brackets totally invisible? She didn’t use any. Instead, she attached the shelf directly to the wall studs. 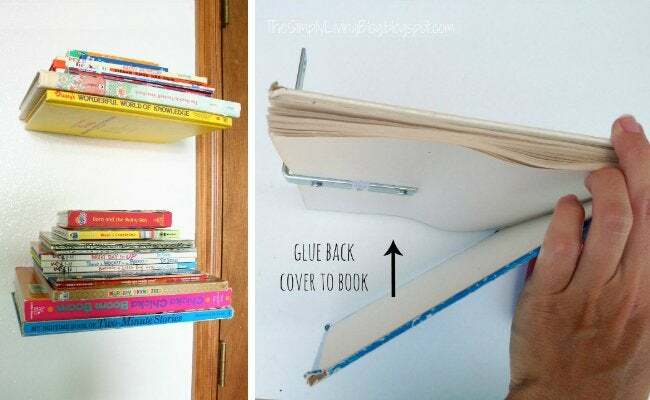 If you’re sick of running out of space in your library, try this fun approach to DIY floating shelves. Pick up a bargain-priced large-format hardcover, attach a metal bracket to its back, and that book becomes a base on which to rest a stack of other books. For step-by-step instructions, visit The Simply Living Blog. 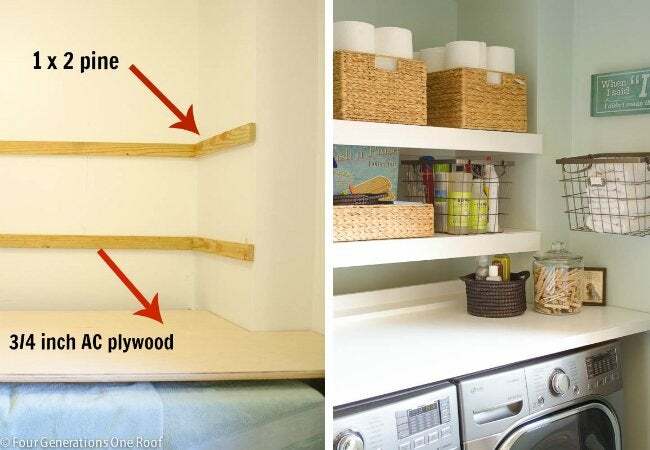 In a storage-starved laundry room, DIY floating shelves accommodate supplies like bleach and detergent, while also providing a surface for separating and folding. Jessica of Four Generations One Roof built hers from plywood, fixing them to the wall with pine cleats. Go now to get the full how-to on her blog. A utilitarian ladder and a handful of L-brackets: Sounds like part of the materials list for an average home improvement, right? Well, in this case, those materials are the project. Tabitha from Fresh Mommy Blog reimagined the ladder as a DIY shelf, filling the space between rungs with books and collectibles. In small homes, capitalized on the corners that might be overlooked in a larger space. 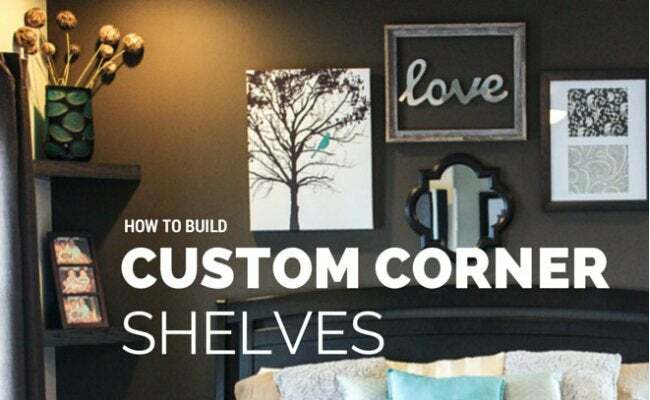 Mandy at House of Rose offers a terrific tutorial on building DIY floating shelves with a triangle design tailored to fit at the meeting place between walls. We’ll need to practice self-restraint not to put these everywhere!